Cleburne, TX – BNSF Logistics, LLC, a leading multi-modal third-party logistics service provider, announced today that they have added a new 20-axle railcar, the TEXX 900, to their specialized railcar fleet which will be available for customer use immediately. This 20-axle shiftable depressed deck flatcar will bring customers a new option for moving heavy haul and over dimensional loads. The TEXX 900 can haul more than 900,000lbs and can shift up 13-inches, down 11-inches, and 14-inches left to right. The deck space will allow for cargo up to 40ft L x 16ft H x 14ft W, making the TEXX 900 the leading choice for the most complex project moves. “We are excited for this new addition to the BNSF Logistics rail fleet. The TEXX 900 is one of three similar cars in North America and the only of its kind available for booking outside a private fleet. 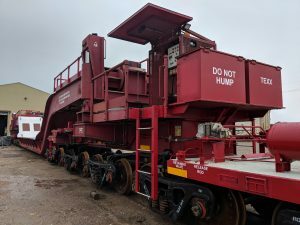 We are so proud of our engineers for their relentless work to restore this car to be a lighter, stronger asset,” Dan Curtis, BNSF Logistics President, said.